Native plants of Virginia are those that grow best, and have evolved within, Virginia's climate and regional traits. According to the Virginia Department of Conservation and Recreation, the best list of native plants of Virginia to utilize for local gardening is one compiled by the Virginia Native Plant Society. This list focuses on native plants which are "available in the nursery trade" to ensure that you do not dig up native plants found in the wild. Carolina jessamine vines (Gelsemium sempervirens), also known as Carolina jasmine, are evergreen native plants to Virginia. These vines display early spring-blooming, yellow flowers and glossy, dark green foliage that turns purple during the winter season. Carolina jessamine vines are rapid growers that thrive in Virginia's full sun, prefer acid, rich, well-drained soil and reach a height of 3 feet (if not used as a climbing vine) with a potential width of 20 to 30 feet. Carolina jessamine vines grow along fences as well as trees found in open woodlands, according to the Clemson University Extension. Grow Carolina jessamine in Hardiness Zones 7 to 9. Witch hazel shrubs (Hamamelis virginiana) are native plants of Virginia that display fall-blooming, aromatic, cream/yellow flowers with glossy, dark green foliage that turns yellow during the fall season. Slow to moderate growers, deciduous witch hazel shrubs thrive in full sun to partial shade, prefer moist, well-drained soil. Witch hazel are found in shaded areas near stream banks and grow to a height of 15 to 30 feet with a width of 15 to 25 feet, according to the NC State University Cooperative Extension. Grow witch hazel in Hardiness Zones 4 to 9. Maidenhair ferns (Adiantum pedatum), also known as Northern maidenhair or common maidenhair ferns, are native plants of Virginia. These deciduous ferns display blue-green, tightly grouped foliage. Maidenhair ferns thrive in partial to full shade, are drought tolerant, prefer moist, rich soil and grow to a height of 18 to 36 inches, according to the NC State University Cooperative Extension. Grow maidenhair ferns in Hardiness Zones 3 to 8 and shady garden areas. Sweetbay magnolia trees (Magnolia virginiana), also referred to as swamp magnolias, are native to the state of Virginia. 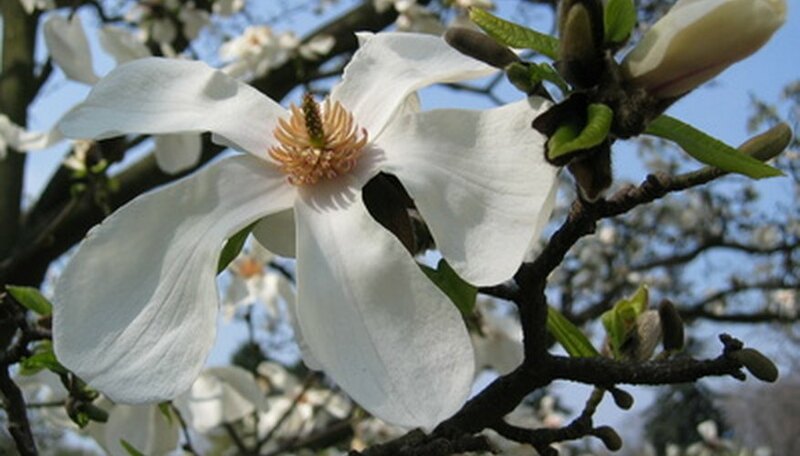 The evergreen to semi-evergreen sweetbay magnolia tree displays large, aromatic, white or cream flowers with gray-green leaves, according to the NC State University Cooperative Extension. With a moderate to rapid growth rate, sweetbay magnolia thrives in full sun to partial shade, prefers moist soil and coastal areas (but may be planted next to buildings) and grows to a height of 10 to 60 feet with a width of 10 to 20 feet. Grow sweetbay magnolia in Hardiness Zones 5 to 9.